It's the hottest time of the year in Japan, 37C today, and we are feeling the heat and humidity. In Japanese culture one of the ways to beat the heat is to induce shivering, either with a scary story or images of cold things. This story of a mother and child and the wondrous environment in which they live is perfect for instigating both cold shivers and smiles. Poet Pendziwol provides a comforting modern lullaby that is a joy to read. I think this might be the most Canadian book I have ever read to my kids. The footprints in the snow, the falling flakes, the open sky, the northern lights, and the animals around them were all part of my winter nights on the Canadian prairies. 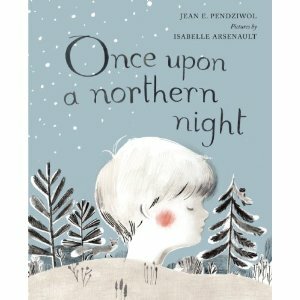 But the way Pendziwol thinks about these nights gives a new perspective. The evocative verse pairs extremely well with Arsenault's start mixed media illustrations. The use of colour is limited, but the impact of each colour when used is big. Arsenault illustrated my favourite book from 2012, Virginia Wolf, and this book shows us why she has won so many awards for illustration (including the prestigious Governor General's Award!). Her northern night is breathtaking. This is the fourth book I have reviewed for the Seventh Canadian Book Challenge. This sounds like such an interesting book. I could just picture a winter scene in Canada just from your description. Thanks for sharing and enjoy Japan, heat and humidity and all.